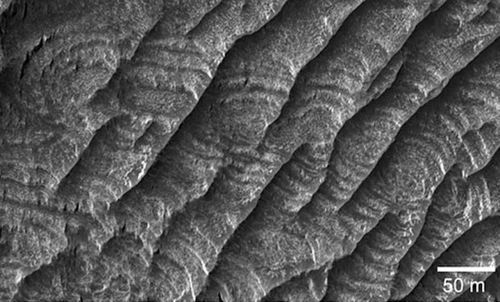 Periodic bedrock ridges on Mars; a geologic feature found on Mars, but not on Earth. These ridges are etched into the bedrock of the planet, and run perpendicular to the direction of the prevailing wind. This entry was posted in Front Page and tagged astronomy, geology, mars, Posthorn, Repost, science, Tumblr on 26/03/2012 by John.